ADV-8120 - Multi-Channel H.264 HDMI HD/SD Encoder | AdvancedDigital Inc. The ADV-8120 is a multichannel encoding device developed for the purpose of converting HDMI inputs into broadcast standard IP and DVB-ASI streams . It has a choice of 8/12/16/20/24 HDMI video input interfaces, supporting H.264 / MPEG-4 AVC video encoding and MPEG-1 Layer 2 audio encoding. This device can simultaneously encode 8/12/16/20/24 HDMI channels. ADV-8120 has an IP output port that supports 1MPTS or 8/12/16/20/24 SPTS IP outputs. A DVB-ASI output port supporting ASI MPTS output is also available. 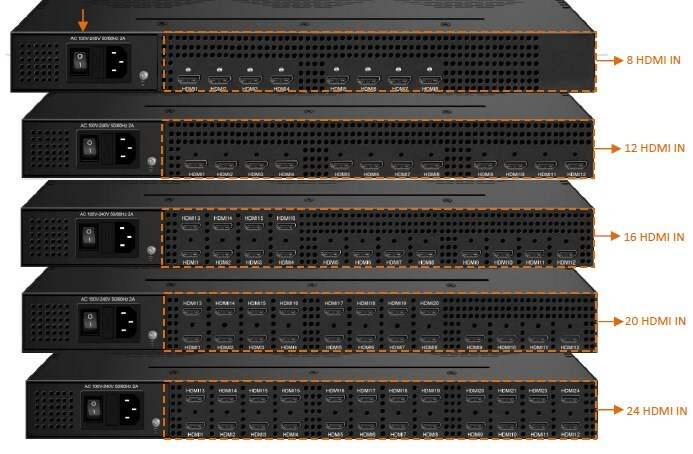 The ADV-8120’s low cost makes it ideal for commercial video distribution and monitoring.